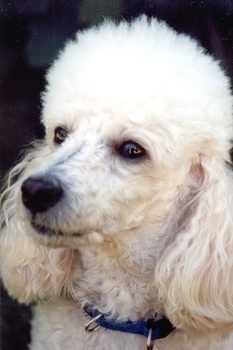 Neonatal encephalopathy with seizures (NEWS) is an inherited neurologic condition known to affect all types of Poodles. Affected dogs appear small at birth and begin to develop abnormal neurologic symptoms around 3 weeks of life. Symptoms include muscle weakness, tremors, and abnormal body movement and affected dogs tend not to interact with their littermates. The disease quickly progresses with the onset of seizures and affected dogs typically die or are euthanized by 7 or 8 weeks of age. Genetic testing of the ATF2 gene that causes NEWS is available. Possible testing outcomes of this recessive disease include normal (clear), carrier and affected. Carrier dogs have one copy of the gene and although they do not have any features of the disease, when bred with another dog that also is a carrier of the same condition, there is 25% risk of having affected puppies that have two copies of the mutated gene. Genetic testing should be implemented PRIOR to breeding. Paw Print Genetics™ can provide you with Genetic Counseling to help eliminate this disease from your breeding lines. If testing has not been performed, genetic testing should be used PRIOR to buying that new puppy to avoid this devastating disease.